It’s no secret that people are OBSESSED with pumpkin spice. As soon as September rolls around, people are jonesing for pumpkin spice lattes, pumpkin butter, pumpkin spice yogurt, pumpkin spice chips, and whatever other ridiculous pumpkin concoctions have flooded the market. To feed your addiction for that classic autumn taste, we found the top 12 pumpkin recipes you can make at home that are exceptionally tasty. Take a look. Pumpkin has that warm and comforting aroma. 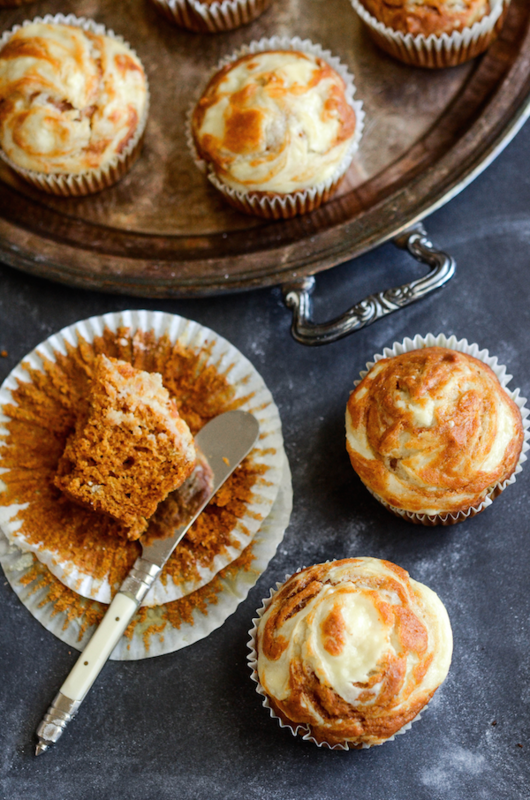 Fill your house with good smells and good eats with these pumpkin cream cheese swirl muffins. The cream cheese offsets the healthy benefits of pumpkin, but adds creaminess and moisture to each bite. These muffins freeze like champions, so if you know you’re going to crave pumpkin once the weather heats up again, pop some in the freezer. You can let them defrost at room temperature on the counter, and then enjoy with soup or à la mode as a dessert. You can make these even more ridiculously good by crumbling brown sugar and butter on top too. People seem to share the love of pumpkin… to an extreme. Share your love of pumpkin with your friends and family by making this pull-apart pumpkin monkey bread. Pumpkin acts much like banana in baked goods—it adds lots of moisture and flavor—so you can anticipate fluffy bites of moist, sweet bread. 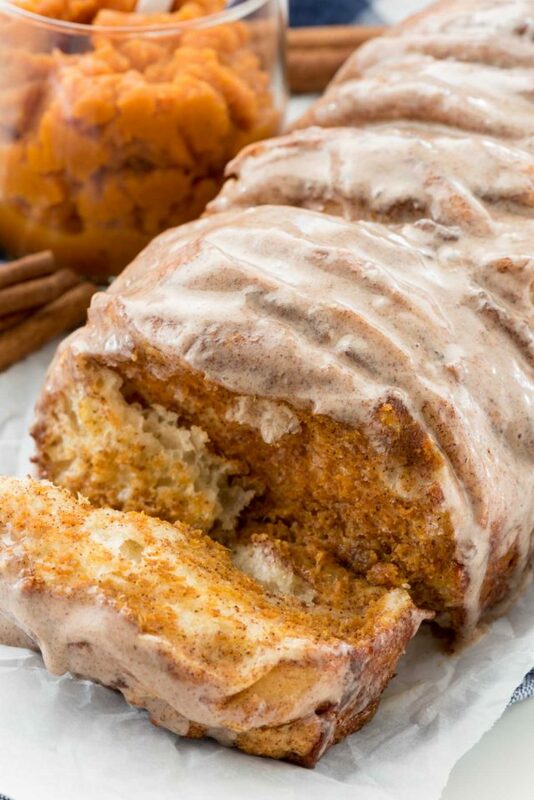 The strudel glaze on this pumpkin pull-apart bread incorporates more sweetness into the dessert. However, you can nix it if you’re trying to keep sugar intake to a low. If you don’t care either way, you can also try drizzling caramel and nuts on top for more texture and salty sweetness. Starbucks has long lines and expensive coffee drinks and desserts. 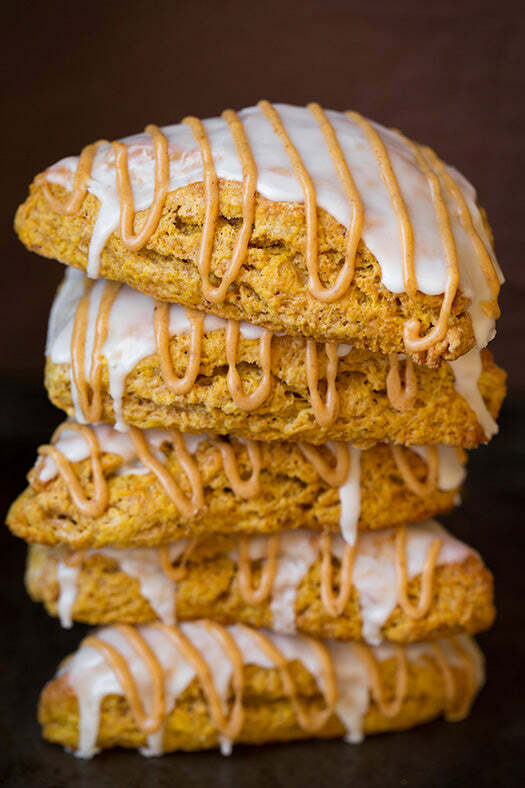 Save yourself a trip and a few bucks by making these identical pumpkin scones at home! A great part of baking and preparing food yourself is that you control the ingredients. If you want to lighten these scones up, use a lower calorie sweetener or forgo the frosting. You can also add more flavor by doubling the spice ratio. You can also throw some coffee flavors in there or just eat them with some coffee candies nearby. As the baker, it’s all up to you and your taste buds, so follow your stomach! 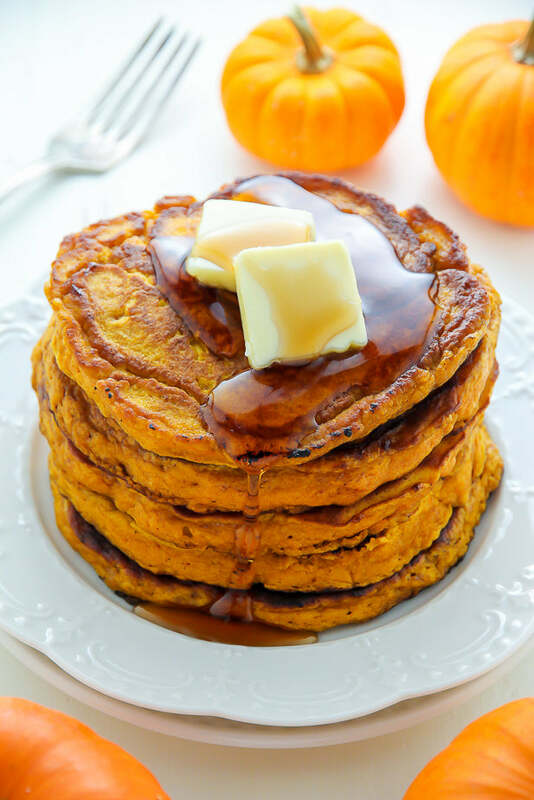 If you’ve never had pumpkin pancakes, now is your chance to realize your new favorite breakfast food. Not only is pumpkin healthy for you, but it makes pancakes fluffier and tastier than ever. You can also make these healthier by adding flax meal, substituting whole wheat flour, and incorporating buckwheat. The next time people are around on a lazy weekend day, whip up a batch of these. 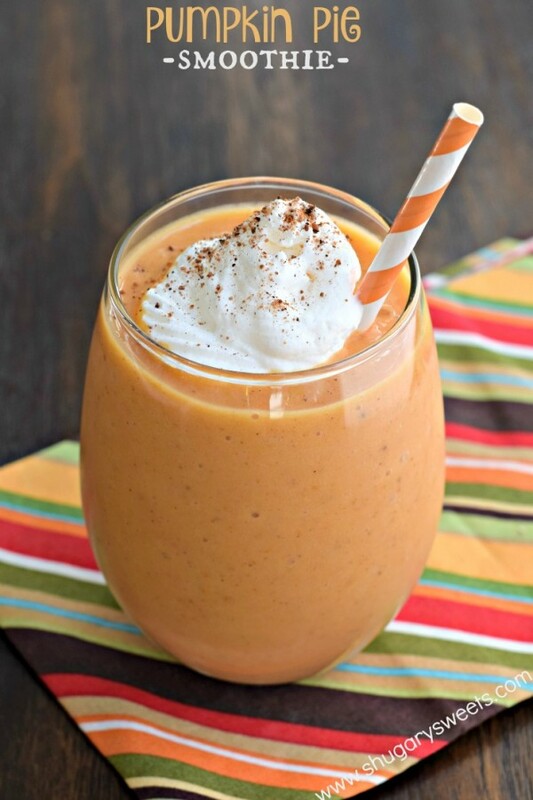 Even have a pumpkin party by serving pumpkin spice lattes, pumpkin smoothies (next recipe), and other favorite pumpkin treats. Pumpkin is beneficial for your vision, heart, and blood pressure. It’s also just plain delicious. When you make these pumpkin pie smoothies, you’ll be able to enjoy something yummy and that’s actually pretty good for you. While this whipped cream-topped smoothie may not look healthy, it’s full of spices, pumpkin purée, yogurt, banana, and protein-filled milk. If you’re vegan, you can use almond milk to enjoy these smoothies too. Pumpkin has the unique ability to become savory or sweet. This recipe exemplifies the former. 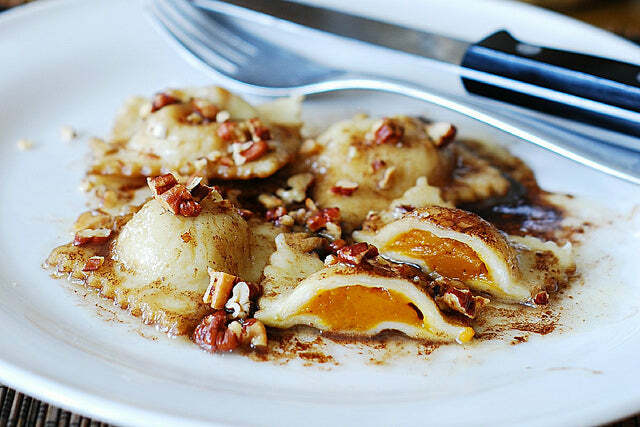 With browned butter, sage, nuts, and warm savory pumpkin filling, these pumpkin raviolis are absolutely gourmet. Making your own ravioli is a bit time-consuming, but so worth it. While you have your hands dirty, do yourself a favor and make a big batch. You can make fresh ravioli for dinner and freeze servings for a later date. Who doesn’t love coming home from a long day and banging out a home-cooked meal in a matter of minutes? 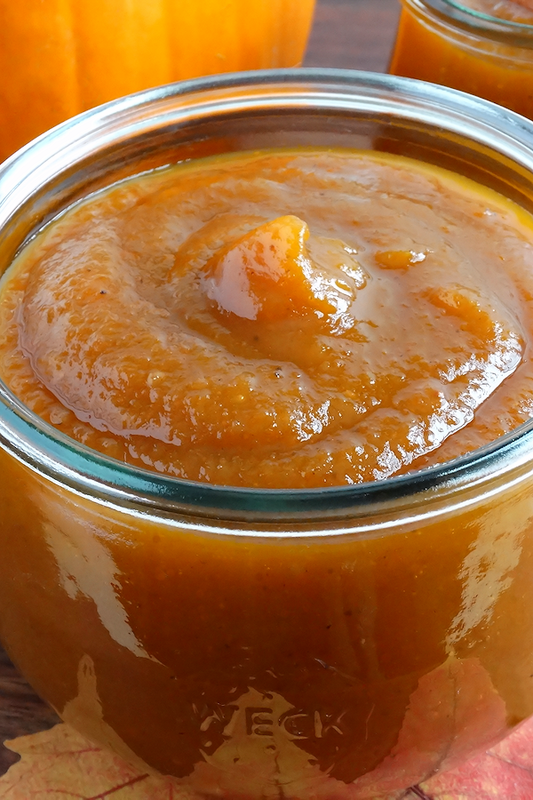 You may have had apple butter, but pumpkin butter is another fantastic fall favorite. Instead of taking close to 12 hours to make (like apple butter), this pumpkin butter can be completed in 25 minutes. This pumpkin butter is incredible on the pumpkin swirl muffins we featured up top, and on pancakes, French toast, and croissants. Once you make it, we’re sure you’ll find ways to slather it on and enjoy this amazing creation. Coffee creamers are a cult classic; everyone seems to have their favorite. Now, you can make your own pumpkin spice coffee creamer at home, so everything can be pumpkin flavored! Word to the wise: store-bought creamers have a really long shelf life because they’re full of preservatives. This homemade creamer will have a significantly shorter lifespan, so use it up quick! 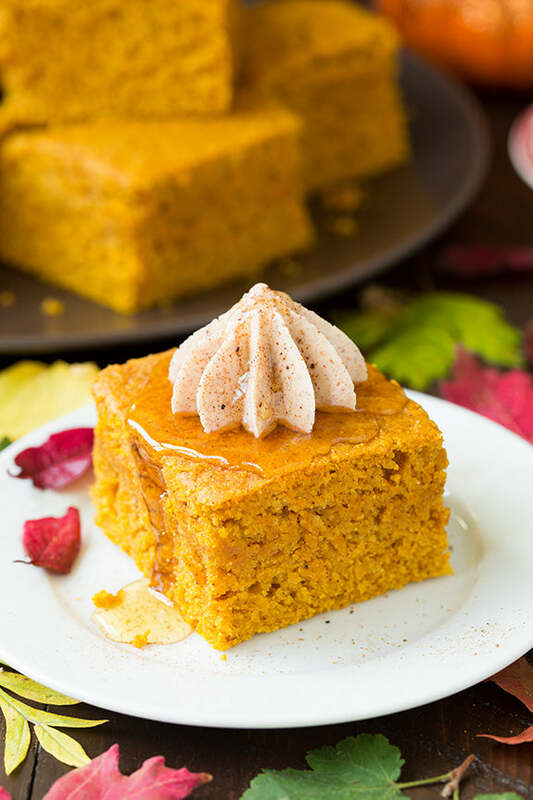 Served next to a hearty smoked chili, this pumpkin spice cornbread is a real show-stopper! Break out your cast iron skillet, pumpkin purée, and fresh pumpkin butter and honey for this dish. It’s best served warm, so make it while you’re cooking dinner and you’ll have a meal fit for royalty. If cornbread isn’t your thing, you can easily make these into cornbread muffins. Just use cute muffin wraps and shorten the baking time. That way, you can take these pumpkin corn cakes with you without as much of a crumbly mess. 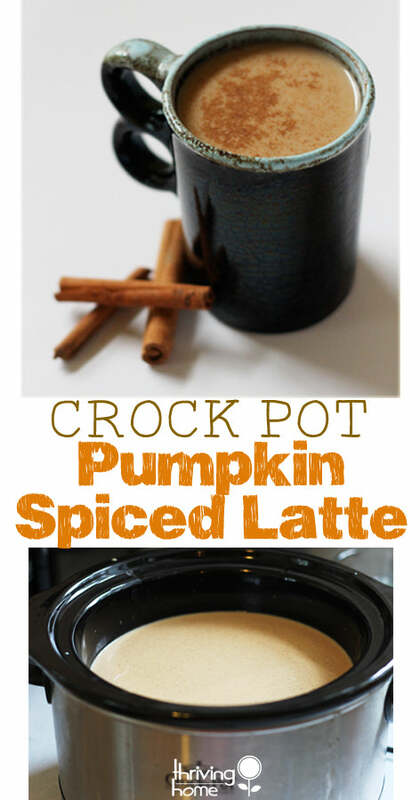 Guys, you can make pumpkin spice lattes at home—and in the crockpot! This has to be one of the best revelations in a few years. Before you go to bed, fill the crockpot with ingredients, and wake up to a fresh pumpkin spice latte you can enjoy in bed. Since this includes dairy, you’ll want to refrigerate this latte mix once it’s done cooking. 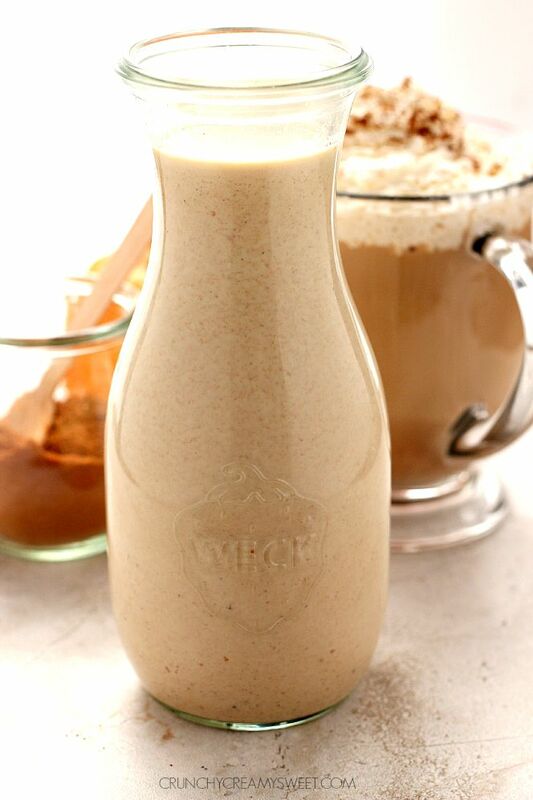 Iced pumpkin spice lattes are equally as delicious with whipped cream on top, and so are frozen versions! You can make them frozen if you whip this mixture up with ice in a blender. Oh, the possibilities! For those of you who want to try a savory pumpkin recipe, but don’t want to sweat it out over ravioli, this is the recipe for you. 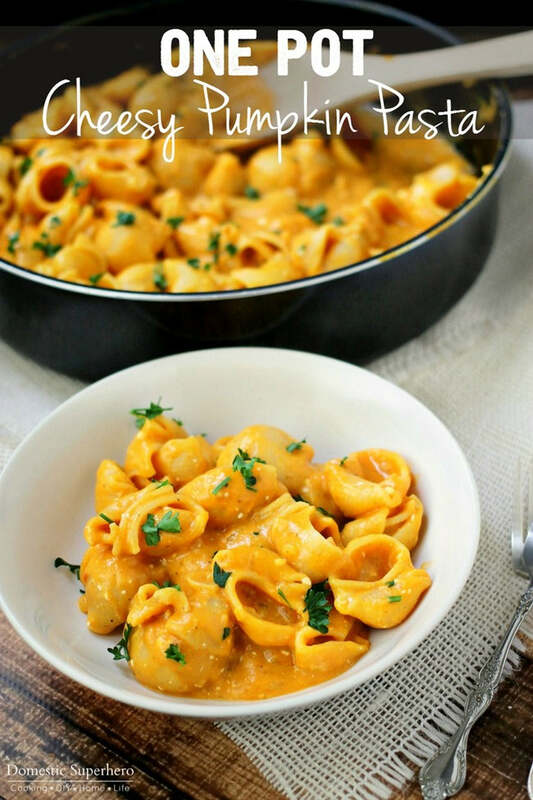 This cheesy pumpkin pasta is so creamy and incredible. Plus, it’s done in one pot, so even the clean-up is easier. Sage and pumpkin go hand-in-hand. To amp up this recipe, pan fry fresh sage leaves for crispy and fragrant effect. Also consider using a more elegant pasta shape like rigatoni or ziti for gourmet appeal. 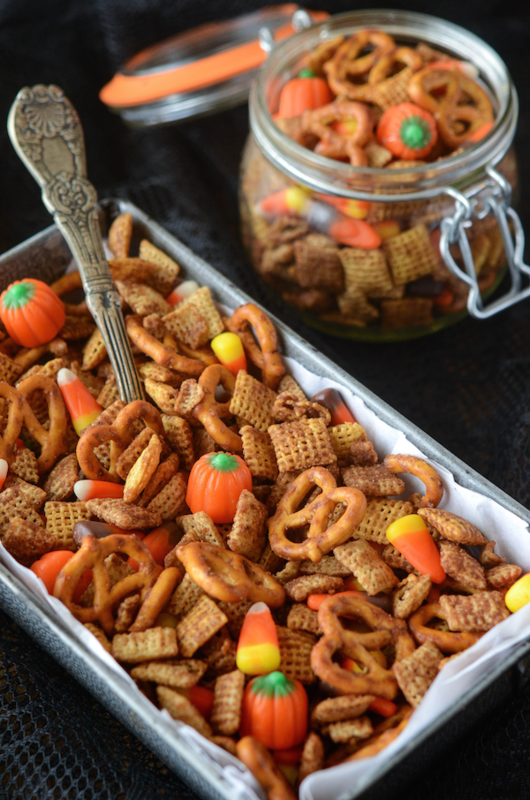 Trail mix is something you can make quickly for a party or to pack in school lunches, This pumpkin spice Chex mix is a classic you’ll want to bake all the time. With crispy and salty pretzels, pumpkin pie spices, and candy corn, it’s sweet and satisfying. Here’s a tip: Throw this in the oven 20 minutes before guests arrive, so it makes your house smell warm and inviting!